This artist's illustration represents the variety of planets being detected by NASA's Kepler spacecraft. Editor's note: Meg Urry is the Israel Munson professor of physics and astronomy and chairwoman of the department of physics at Yale University, where she is the director of the Yale Center for Astronomy and Astrophysics. 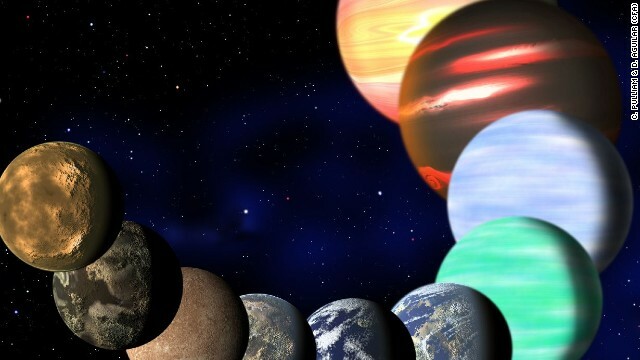 (CNN) - On Wednesday, NASA officials announced a serious problem with the Kepler satellite, the world's most successful planet-finding machine. Since its launch four years ago, Kepler has found more than 2,700 possible planets orbiting stars other than our Sun, of which more than 100 have been confirmed. A few of these exoplanets resemble the Earth in size or mass. Recently, three Earth-like planets were even reported to be in the habitable zone: close enough to the star they orbit that water is liquid, yet not so close that it is boiling. Planets with liquid water may well harbor life. "Kepler or not, we'll find life in space"
Buck, so are you implying that ever since NASA faked the moon landings that they virtually fake everything? Why this conjecture actually makes sense, but why such an elaborate hoax? Anyway, unlike mr. Black (of whom I have already explained the true physics of hypersonic reentry which vaporizes any and all material), many folks are waking up to NASA's massive fraud, which actually began during WWII. All of the Nazi scientists knew that a human could not survive space, much less a 8km/sec meteoric reentry, hence the whole thing was, is, and always will be a 'show' to con the masses. Reason? Astro-evolution. Indeed, NASA's "origins program" is designed to promote non-scientific evolution while trying to 'debunk' Genesis. It's all going to quickly unravel, and folks like mr. Black's heart will faint, and fear will grip the masses because mankind's evolutionary 'knowledge' has been exposed as nothing but a fairytale 'backed' by fraud. I harbor life inside my planets. big shiz i love you man!